You can improve your business' competitiveness and productivity through funded partnerships with academics and researchers. The Knowledge Transfer Partnership (KTP) scheme helps businesses in the UK to innovate and grow. It does this by linking them with an academic or research organisation and a graduate. 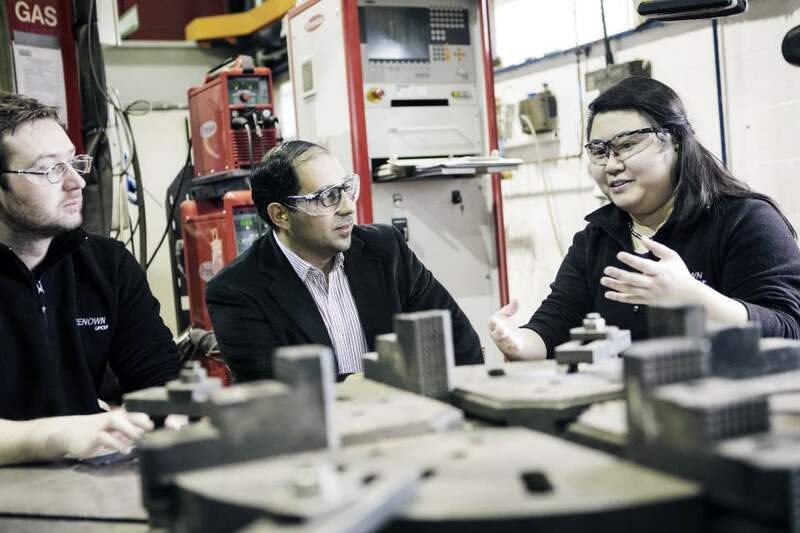 A KTP enables a business to bring in new skills and the latest academic thinking to deliver a specific, strategic innovation project through a knowledge-based partnership. The academic or research organisation partner will help to recruit a suitable graduate, known as an Associate. They will act as the employer of the graduate, who then works at the company for the duration. The scheme can last between 12 and 36 months, depending on what the project is and the needs of the business. Taking part in a KTP can help you to develop your business. You can get academic expertise that you don’t have in-house. This can improve your business performance and help you to become more competitive and productive. A KTP is part-funded by a grant. You will need to contribute to the salary of the Associate who will work with your business, plus the cost of a supervisor who will oversee the scheme. Academic partners who take part in a KTP produce on average more than 3 new research projects and 2 research papers for each project. Most academic and research organisations will have a dedicated KTP office. These offices work with the business and academic partners who intend to collaborate together to scope out the project. They can also help with the application to Innovate UK. Find contact details for your KTP office. KTP is one of the UK’s largest graduate recruitment programmes. There are over 300 job opportunities each year. It supports career development and often leads to a permanent job. KTP associate Lydia Chan in a meeting with colleagues at Renown's manufacturing facility. Get a closer look at some of the successful KTPs in the North East. There are 2 main routes to applying for a KTP as a business. If you already have a partnership with an academic or research organisation or know who you would like to work with on a KTP, you should go via that organisation’s KTP office. A KTP application must be completed jointly by the prospective business and the academic or research organisation partner, with the agreement of a KT Adviser. It should include information about each of the participants, their objectives, the proposed tasks and deliverables for the Associate. The completed application should be submitted by the academic or research organisation. They will have access to a KTP applicants site where they will be able to do this. Applications are assessed by an independent group of assessors. You will normally be notified of the outcome within 12 weeks or less of application. If your partnership is successful you will be notified by your KT Adviser in the first instance. You will then receive a formal grant offer letter. Once accepted this marks the point at which you can begin to recruit an Associate. Recruitment should be undertaken jointly by the academic organisation and business partner. The Associate’s contract of employment will be with the academic organisation. You must recruit the most appropriate Associate for the work. Your KT Adviser or KTP office can advise. Our KTP programme 2019 to 2020 is run continuously throughout the year. This table contains the full list of open and close dates. If you have any difficulty in reaching your KTP office contact Innovate UK’s customer support service support@innovateuk.ukri.org or 0300 321 4357. 4 April 2019 Added Sophie O’Callaghan as the University of Exeter's new KTP contact. 26 March 2019 Updated contact details for Imperial College London. 20 February 2019 Added the contact of details for the new KT Adviser for Hertfordshire and London North and Central. Updated contact details for Berkshire, Surrey and London West and Central. 15 February 2019 Changed KTP competition schedule from 2018-19 to 2019-20. 25 January 2019 Corrected the dates and deadlines for the next round of KTP applications, which will run from 7 February 2019 to 3 April 2019. Clarified information about submitting a KTP application. This should be done by the academic or research organisation via a dedicated website that only they will have access to. 16 January 2019 There is a new KTP contact at Newcastle University. Updated details. 8 January 2019 Added a video featuring Qioptiq, a photonics company that undertook a Knowledge Transfer Partnership with Cardiff Business School. This helped Qioptiq to secure an £82 million contract with the Ministry of Defence. 11 December 2018 John Clayton has joined as a KT Adviser for Northumberland, Tees Valley, Tyne and Wear, Durham and North West and North Yorkshire. Added contact information. 29 November 2018 Updated the KTP contact details for the University of Liverpool and University of Warwick. 16 November 2018 Name change for the KTP contact at UCLAN. 7 November 2018 The email address for the KTP office at University College London has changed to ktp@ucl.ac.uk. Updated details. 26 October 2018 There is a new KTP contact at De Montfort University, Tamara Meahan. Updated contact details. 29 August 2018 There is a new contact for the KTP office at the University of Cumbria. Updated contact details. 2 August 2018 There is a new KTP contact for the office at Keele University. Updated contact details. 19 July 2018 Updated the average cost of a KTP for small and medium-sized enterprises, and large businesses. These have increased slightly to £35,000 and £55,000 respectively. 16 July 2018 There is a new KTP contact at the University of Sheffield. Updated details. 5 July 2018 Updated the name and contact details for the KTP office at Wrexham Glyndwr University. 28 June 2018 KTP advisors list updated. 12 June 2018 There is a new KTP contact at Oxford Brookes University. Contact details updated. 31 May 2018 There are new contacts for the KTP offices of Aberystwyth University and University College London. Contact details have been updated. 22 May 2018 There is a new KT Adviser for Tayside and Fife, Lorna Howarth. Her contact details have been added. 10 May 2018 The format for KTPs for 2018 to 2019 has changed. The programme will be run continuously throughout the year. New date and deadlines have been added. Further clarification has been added on how to apply to outline for 2 possible routes for starting an application. 27 April 2018 There is a new contact for KTPs at Queen’s University Belfast. New contact details have been provided. 23 March 2018 Updated the contact details for the University of Hull's KTP office with new contact. 20 February 2018 New KT Adviser appointed to cover Liverpool, East Lancashire and Salford. Contact details have been added for Susan Suttle. 14 February 2018 The KT Adviser for North Scotland has changed to Ian Heywood. Information has been updated and contact details added. 24 January 2018 Updated average cost of a KTP to SMEs and larger businesses, which have increased slightly to £30,000 and £45,000 respectively. 15 January 2018 Change of email address to KTP contact and name of Brunel University London. 9 January 2018 Updated details with new KTP contact at the University of Worcester. 21 December 2017 Updated details for University of Sussex KTP contact. 18 December 2017 Updated latest dates and deadlines. 12 December 2017 Updated contact details for Nottingham Trent University. 7 December 2017 Added new KTP Adviser for Walsall and surrounding area. 30 November 2017 Updated dates and deadlines with new competitions. 24 November 2017 Added KTP contact for Myerscough College. 13 November 2017 Removed contact information of Royal Holloway, who no longer take part in KTPs. Updated Staffordshire University contact details. 10 October 2017 Updated contact details for Lancaster University and University of Lincoln. 4 October 2017 Updated competition dates and deadlines. 18 September 2017 Updated contact details for the University of Plymouth. 31 August 2017 Updated latest competition dates and deadlines. 22 August 2017 Updated details for University of Swansea contact. 9 August 2017 Updated Open University KTP office contact. 8 August 2017 Updated contact details for all KT Advisers. Added new sections on how to apply, what happens after you apply and dates and deadlines, which explain the application process in more detail and how KTPs align with Innovate UK's sector and open competitions for 2017 to 2018. Updated average amount a business is required to contribute in line with latest figures. 25 July 2017 Updated contact information for Cardiff Metropolitan University, City, University of London and the University of Leicester. 7 July 2017 Removed Royal Veterinary College and Goldsmiths, University of London from regional office contacts as they do not take part in KTPs. 30 June 2017 Updated details for University of Bath KTP contact. 19 June 2017 Updated KT contact for Merseyside and West Cheshire and North Wales. 14 June 2017 Added 'open programme round 3' and 'infrastructure systems round 3' to competitions. 2 June 2017 Updated KTP contact details for Keele University. Updated KTP Advisor contact for the North East. 17 May 2017 Updated the KTP contact for the University of Bedfordshire. 12 May 2017 Removed 'emerging and enabling technologies round 2' from live competitions. Updated contact details for University of Chichester and Birmingham City University. 9 May 2017 Added 'materials and manufacturing round 3' to KTP opportunities. Updated KTP case studies. 12 April 2017 Removed 'innovation in health and life sciences round 2' from live competitions. 6 April 2017 Added Bucks New University and University of Suffolk to KTP regional office list. 5 April 2017 Updated contact details for University of Northampton KTP office and added Ella's Kitchen video. 28 March 2017 Contact details updated for KTP offices at London South Bank University, Queen's University Belfast, University of Bradford, University of Reading and University of York. 13 March 2017 Updated close date information and telephone number for University of Derby KTP contact. 3 March 2017 Note added under KTP regional offices to contact Innovate UK customer service support with any problems in contacting local office. 3 March 2017 Updated details for the KTP contact at the University of Plymouth. 2 March 2017 Updated details for the KTP contact at the University of Cambridge and removed 2 universities no longer delivering KTPs. 7 February 2017 Added contact for University of East Anglia. 3 February 2017 Updated Estelle Hargraves' telephone number. 24 January 2017 Updated KTP contact at University of Sussex from Mike Wylde to Dr Richard Taylor. 23 January 2017 Removed January 18 2017 deadline. 14 December 2016 Updated KTP UCL contact from Claire Arbon to Kemil Thomas. 5 December 2016 Changed University of Gloucestershire contact details from Martyn Mangan to Jeannie Cohen-Brand. 28 November 2016 Removed 2 November 2016 deadline. 21 October 2016 Hull University KTP officer changed from Gill Sinclair to Bill Walker. 9 September 2016 Removed 7 September 2016 close date because it has now passed. 19 July 2016 Stephen Woodhouse is no longer responsible for Oxfordshire. Gerry O'Hagan is now responsible for Oxfordshire. 8 July 2016 Removed Sue Wale from Buckinghamshire New University as she has now left. 8 July 2016 Removed 6 July 2016 deadline. 2 March 2016 Applications now have different limits. 11 August 2015 First published.